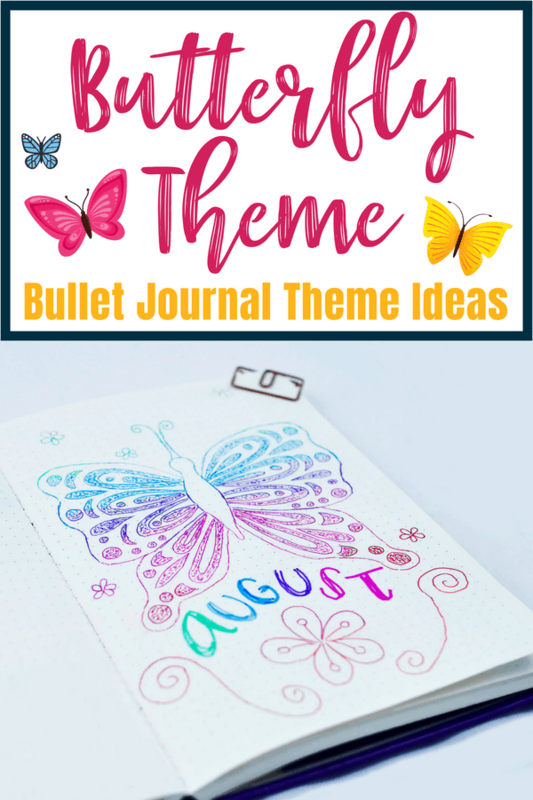 Need fun and unique ideas for your next monthly bullet journal theme? Or maybe just a fun idea for your next tracker or weekly spread? 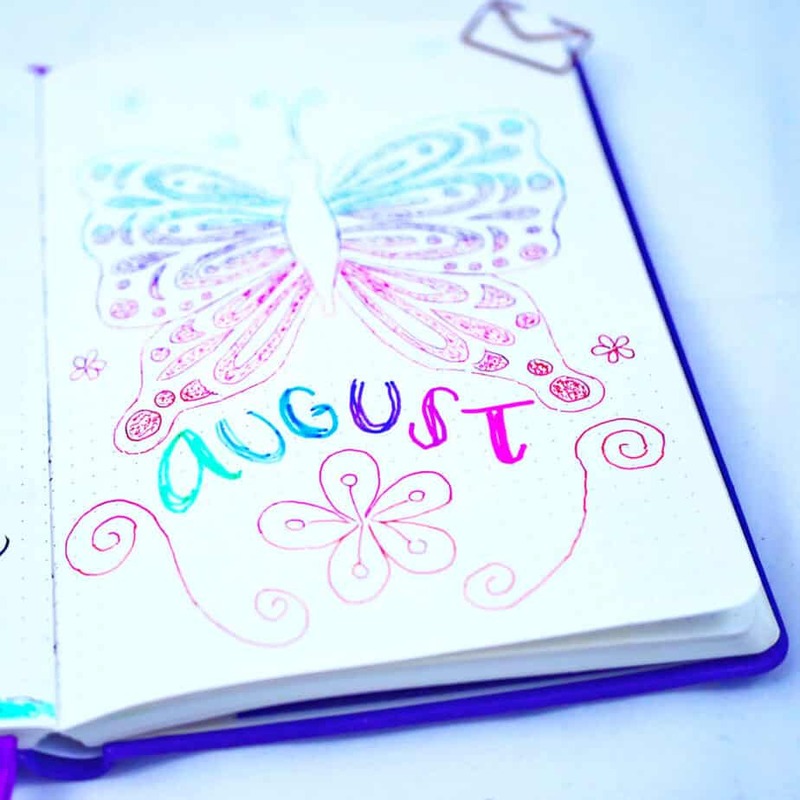 Have you considered decorating your layouts in a beautiful butterfly theme? Butterflies are a great decoration idea you can do so much with them. Butterflies can be simple and minimalist. Butterfly doodles can also contain loads of color and intricate design. They even make cute icons for those who prefer to use functional doodles! 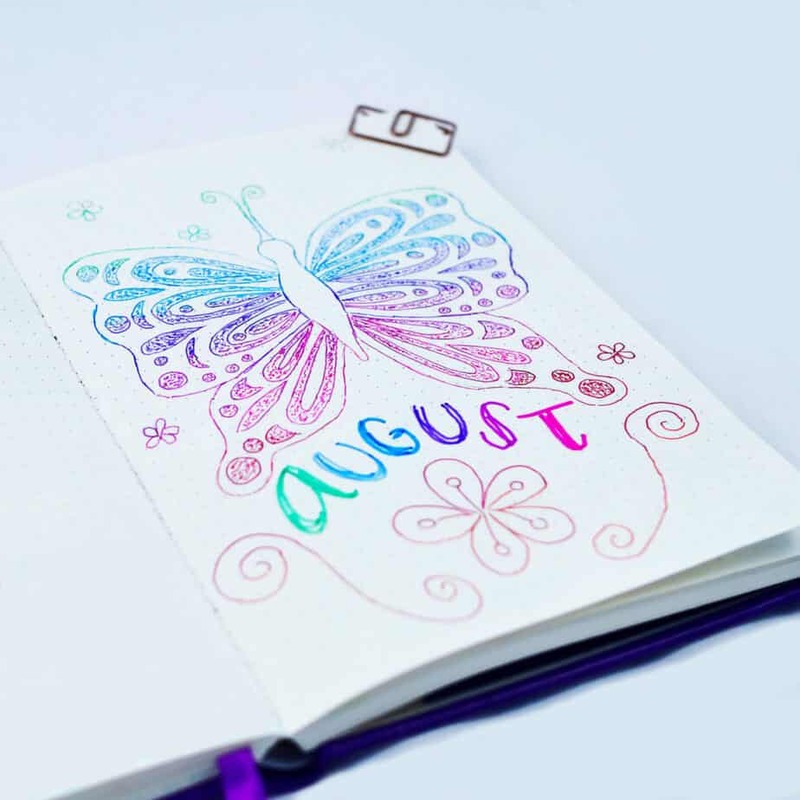 For August 2018, I decided to try out my hand at a butterfly theme after seeing some gorgeous inspiration both on Pinterest and my #plannerpicturefeature feed. Feel free to copy some of the designs I created. You may experiment with some of the decorations that my followers made. Or get inspired to try something completely unique! When I first came up with the idea for a butterfly theme, I worried that it was going to be challenging to come up with unique ideas. It’s a very specific theme choice, after all! For simplicity, I choose the same theme for an entire month. Instead, I was pleasantly surprised at how easy it was to come up with different variations on such a specific bullet journal theme. 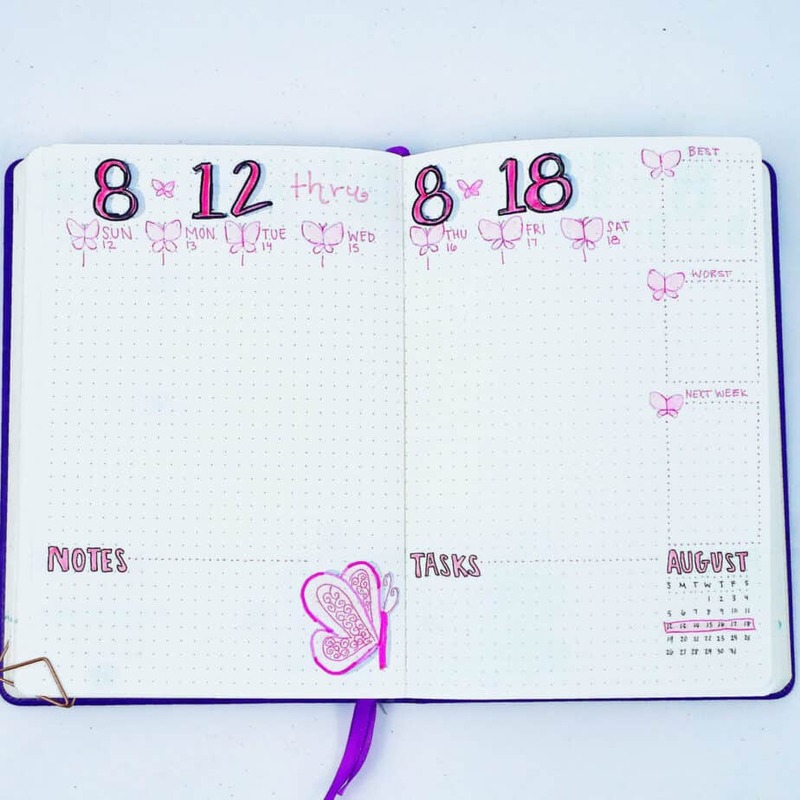 Unsure which bullet journal style suits you? Take the Bullet Journal Style personality quiz! My followers tend to prefer an ‘Adaptable Style’. This means, like me, they enjoy an even mix of different types of styles within their bullet journal spreads. However, this practice is also beneficial for other bullet journals. Why? Because they get to see examples of different types of spreads in their preferred style. I went with an artistic cover page for a butterfly theme. I found a lot of intricate doodles when I searched “butterfly theme” on Pinterest. Many of the doodles I found intimidating to a non-expert artistic,. However, some gorgeous ombre doodles caught my eye. Thus, I decided that I would go for a similar style with my decorative cover page. Personally, I found the Twintone markers to be extremely fun and colorful. I was impressed how well they blended together when transitioning colors. I went with a more minimalist style for my calendar page for August. While I did use many colors (and made another ombre! ), this was a very easy page to set up. Instead of a cohesive monthly calendar, I went with individual boxes to help organize the content. It takes a bit more time to set up, but always creates a clean and crisp appearance. For the habit tracker spread, I decided to go with black and white doodles adorned with multiple patterns. While this page isn’t fully complete, typically I write out the habits that I track on the left side. As I go through the month, I track my habits from left to right. This month, I used a purple Tombow Twintone marker that matched similarly to the Tombow Dual Brush Pen marker I used for the lettering. Since separating my mood tracker and goal trackers, I find I get an awkward extra page leftover. So to make it more fun, I love to include a quote relevant to the bullet journal theme I select. 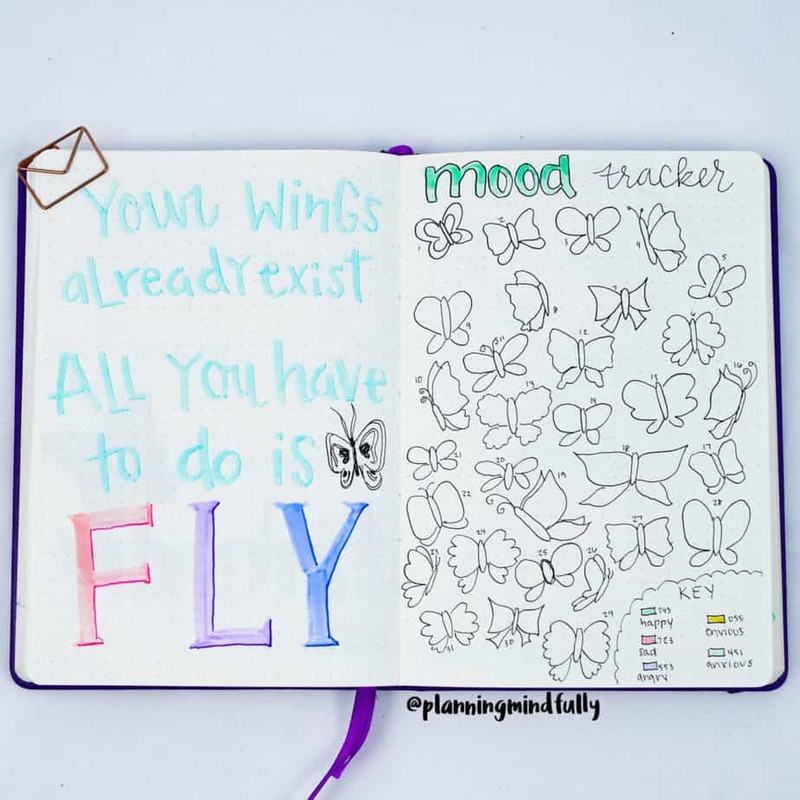 I found this quote “Your wings already exist, all you have to do is fly.” I thought this quote was perfect for a bullet journal theme! 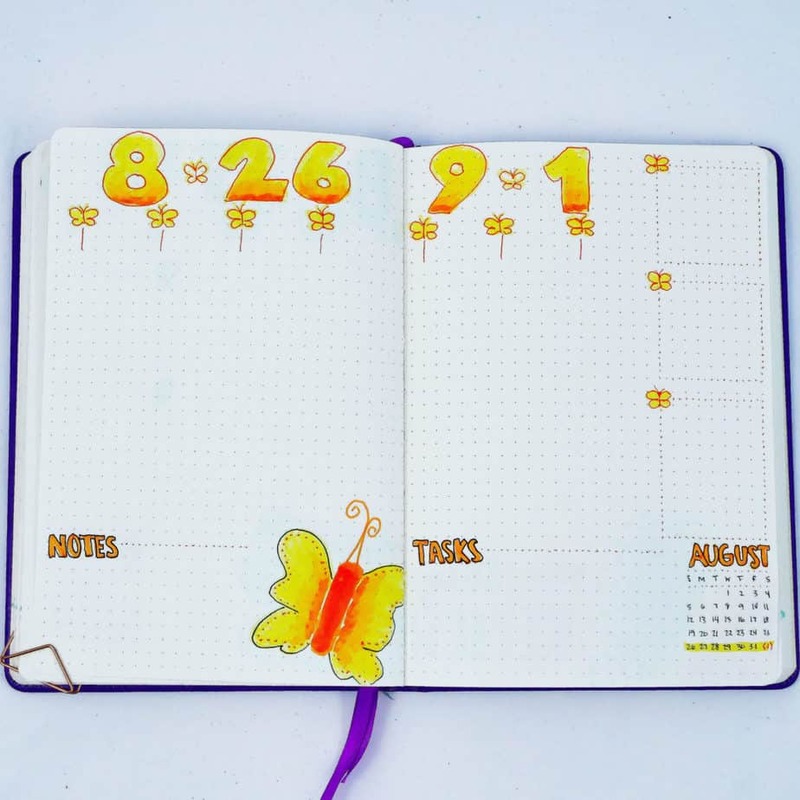 On the next page, I created a fun mood tracker decorated with 31 butterflies (one for each day of the month). One thing I liked about the butterfly mood tracker is that they were simple to create. However, with the butterflies I can easily incorporate more than one mood for each day. I think the butterflies having multiple colors looks really pretty. Not to mention, we tend to have more than one mood per day, right? The goal tracker and time tracker spreads can be relatively busy, so any theme in these spreads needs to be relatively minimalistic. That said, a butterfly theme made it easy to truly show off the theme AND get to create fun art. 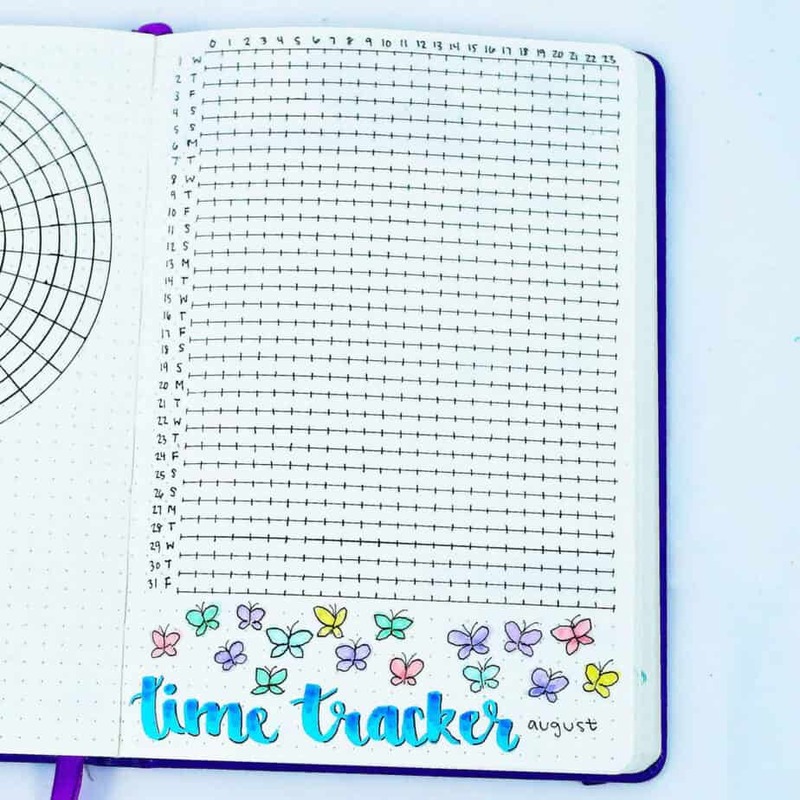 On the goal tracker, a pretty (but minimalist) butterfly is the centerpiece to my circle tracker. For the time tracker, the majority of the spread takes up the entire page. I was able to draw extremely minimalist butterflies filled in with solid color. 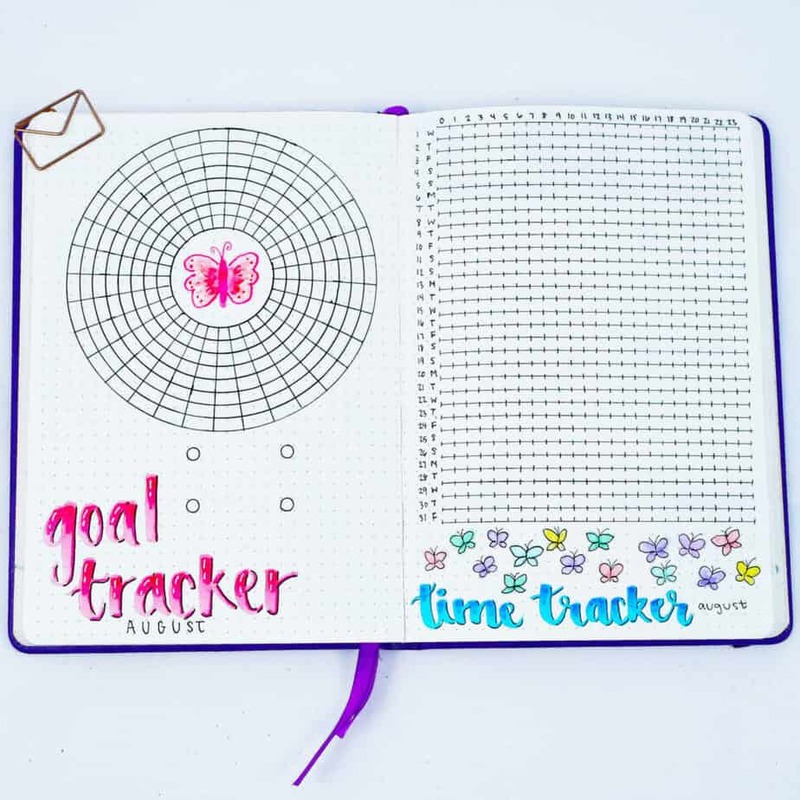 Goal tracker and time tracker with a butterfly theme. A better close up of my time tracker. What isn’t shown in my time tracker is my color-coded key that organizes which colors correspond to each activity. In the front cover of my bullet journal, I’ve developed a key that has each color paired with an activity. I do it this way so I don’t have to create 10 new color categories each month. I tend to keep a relatively consistent look to my weekly spreads for the month. However, I do like to create by trying different doodles, fonts, and colors. 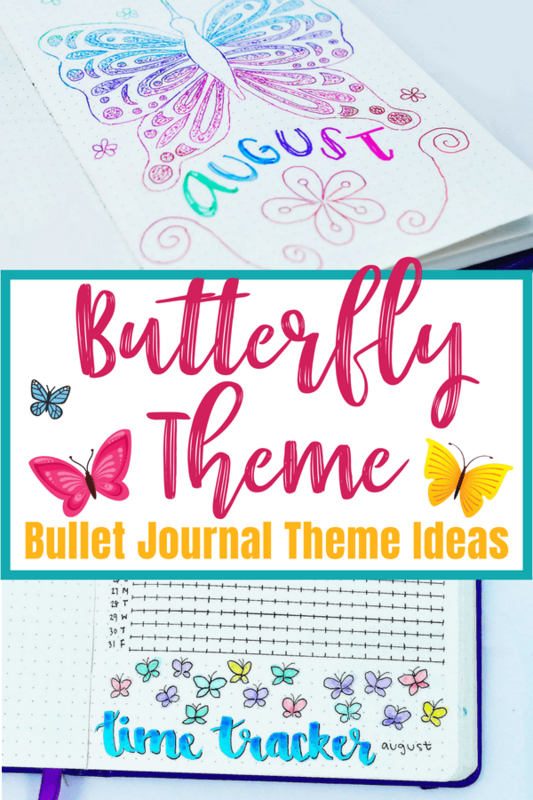 For a butterfly theme, there are lots of fun ways you can decorate your bullet journal weekly layouts. See below for inspiration! 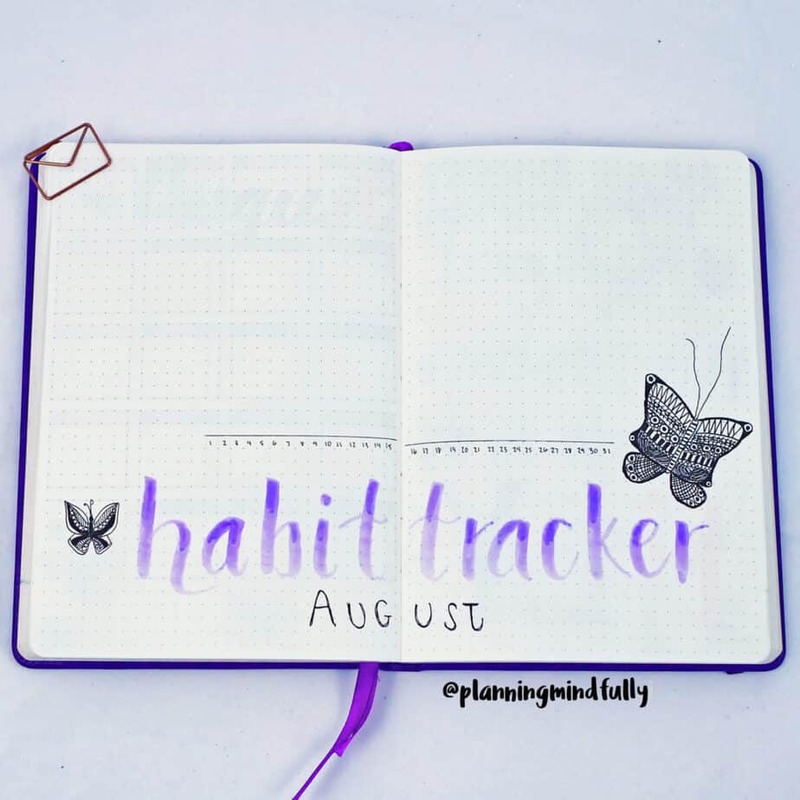 This weekly spread features lots of purple and very minimalist butterfly doodles. I chose this weekly layout for the remaining weekly spreads for the month of August as well. This weekly spread features a lot of blue. This time, I went with colored butterflies to show off the butterfly theme a little differently. I used a gray Tombow Dual Brush Pen to make the bigger butterflies (and the lettering) leap off the page. 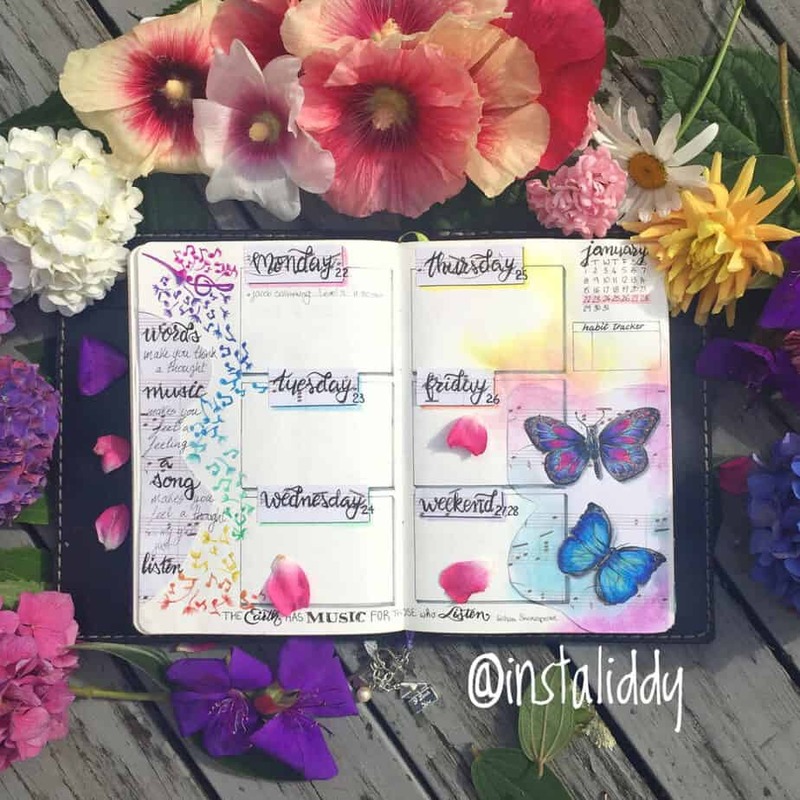 For the third weekly spread, I went with a more delicate butterfly design in pink. As well as creating another larger butterfly centerpiece, I also tried some finer doodles within the entire spread. The fourth weekly spread was all green! I also used gray to make the butterfly and font pop off the page a bit. For the final week, I went with a yellow and orange ombre to give the spread more of a color pop. My monthly review is where I summarize everything I learned from the month before. The monthly review is where I talk about what I learned about myself, what was good, what was bad, and what I want to change for my next month. 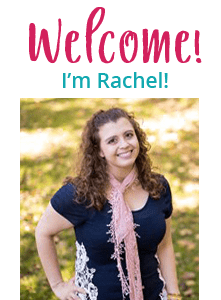 Artistically, the monthly review is also where I get to be creative! I like to combine both my monthly theme for the current month and the next month within the art. Can you tell what the monthly theme will be for the next month? I’m beyond excited to see what next month will bring in my bullet journal. All images above were done with a Scrivwell A5 Dot Grid Notebook. I love getting to see the amazing art that my followers on Instagram create! 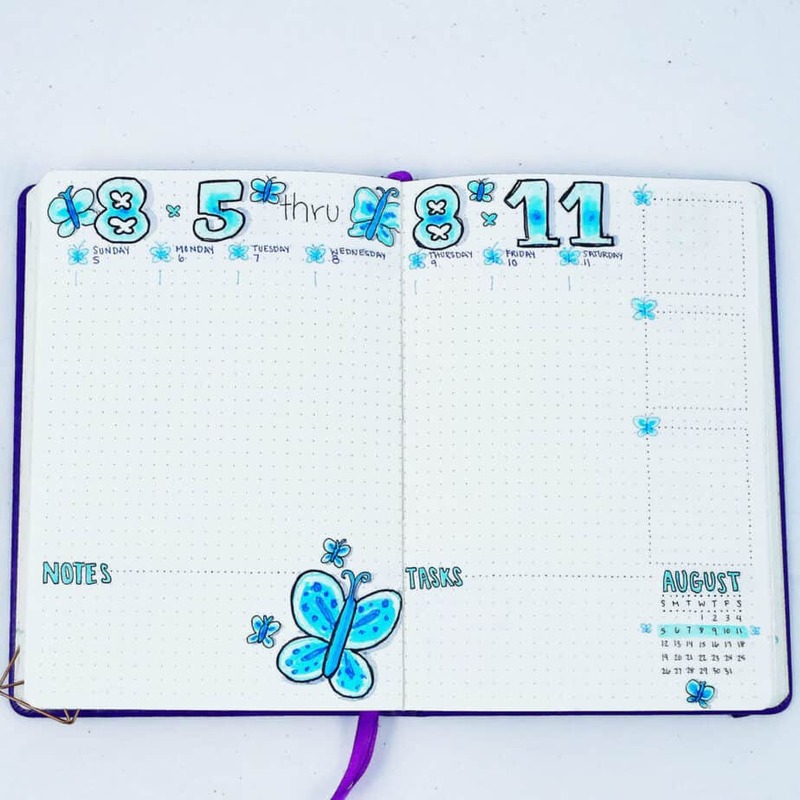 I found some beautiful butterfly theme spreads I had to share with you. 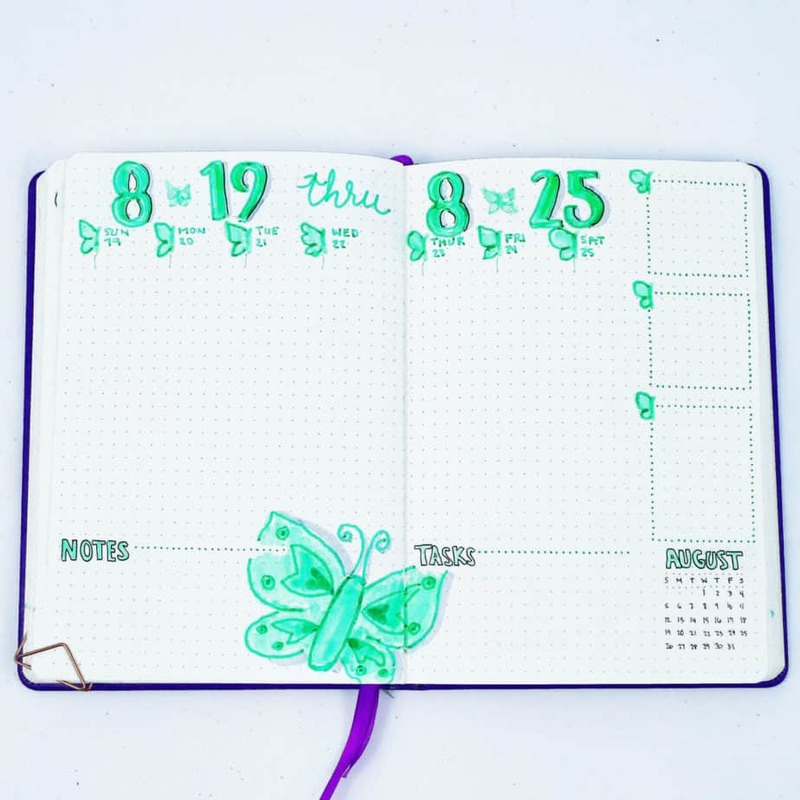 This perfect butterfly theme spread is another amazingly artistic style that flows perfectly into more of a minimalist weekly layout. I love her use of colored pencil and color splatter around her butterfly. If you’d like to see more of her absolutely incredible art, make sure to follow her on Instagram! 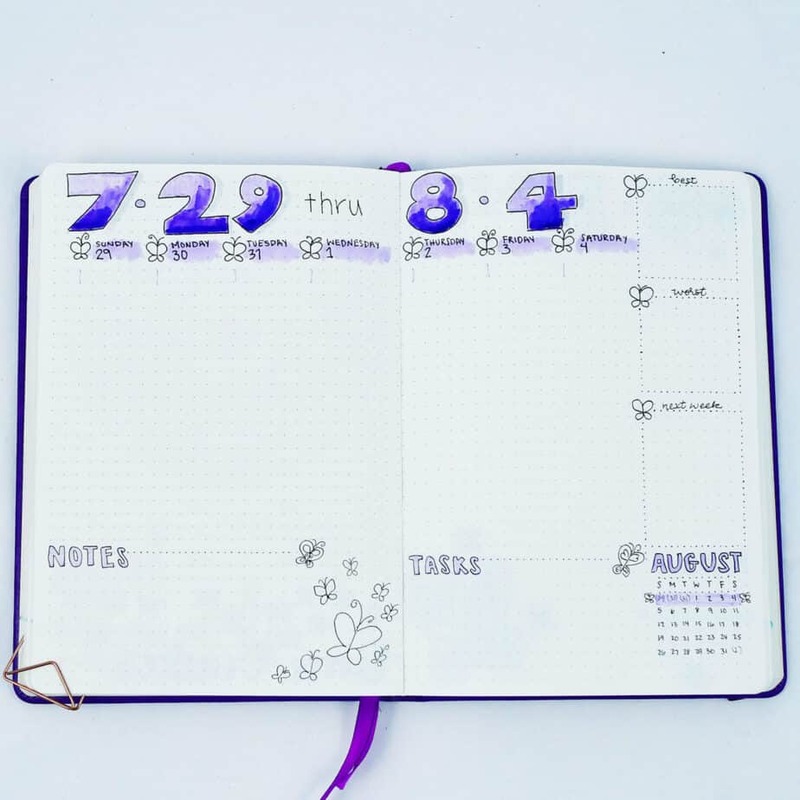 When it comes to fancy bullet journal spreads, my good friend Liddy never disappoints. 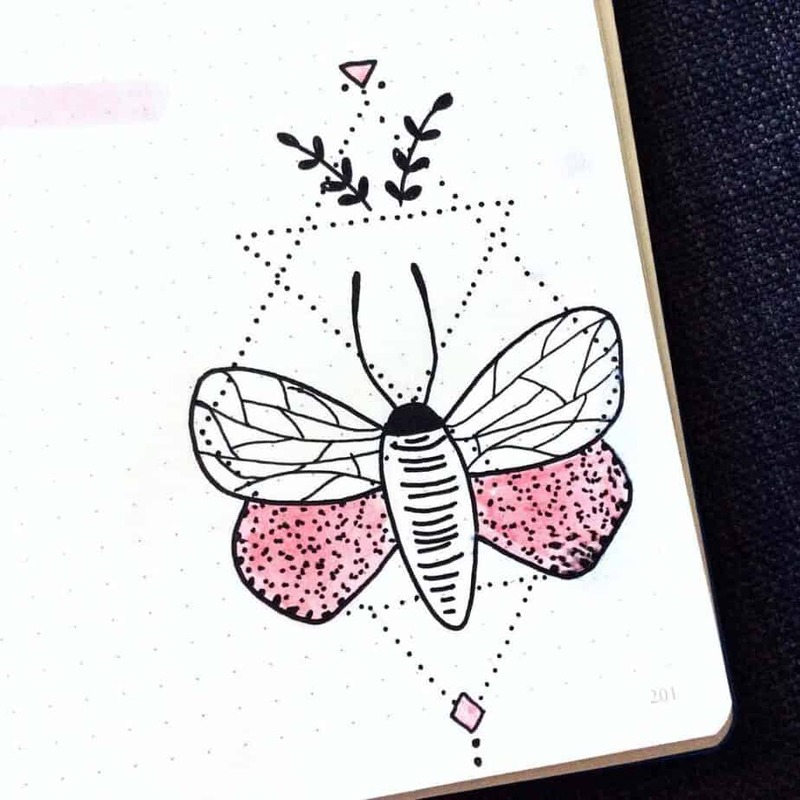 She has some of the most unique, artistic bullet journal pages you’ll ever see in the bullet journal community. I love how she incorporated not only butterflies in this spread, but gorgeous colorful musical notes as well. Another stunning artistic butterfly spread. Instead of going with a colorful beautiful, she went with a gorgeous black and white style adorned with many patterns. I especially love how she included some of the same patterns in her numbers. 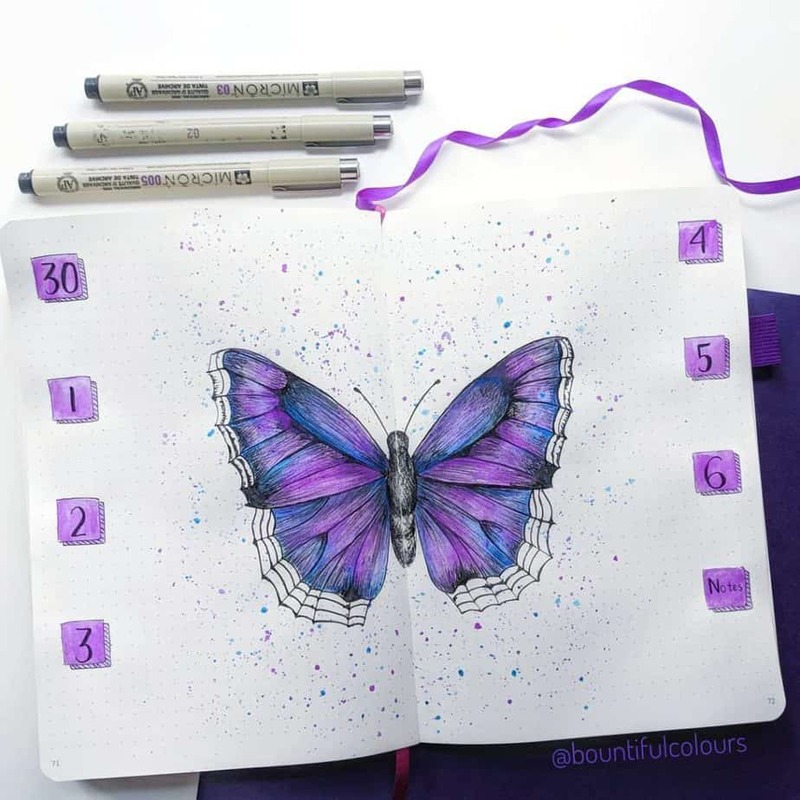 Since I know not everybody in my community is an expert when it comes to art, I wanted to showcase this fun bullet journal butterfly theme from another Instagram account I love so much! 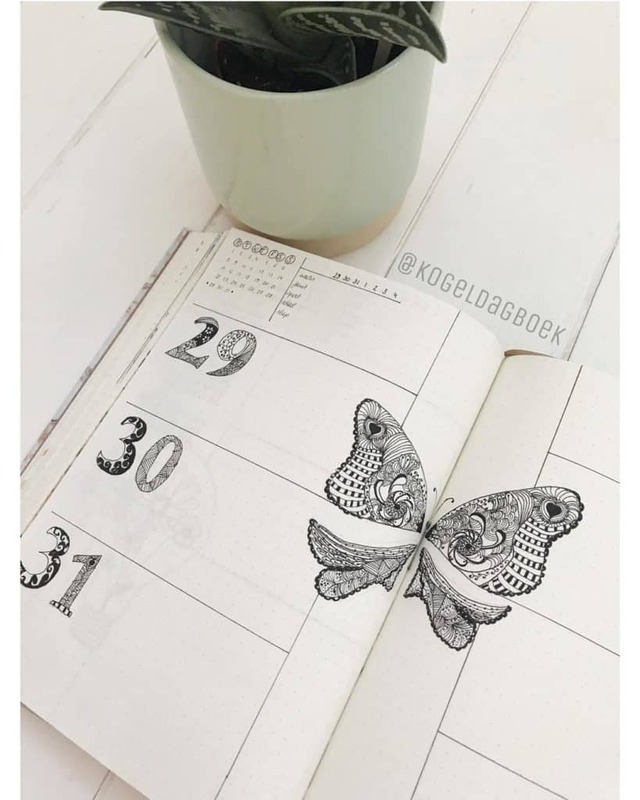 I love how her butterfly doodle is unique, fun, and easy to replicate. 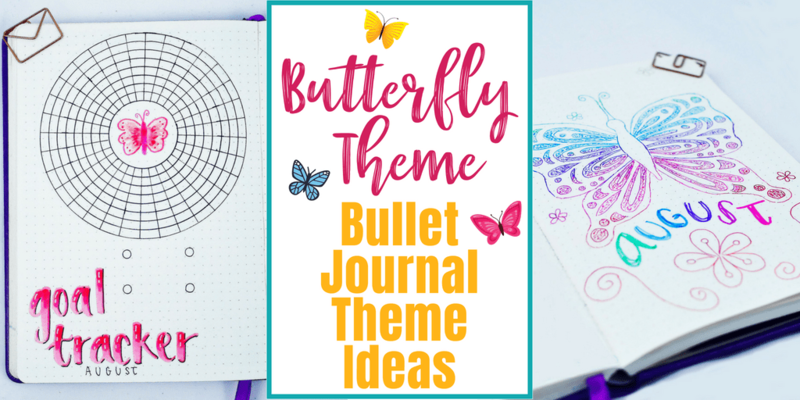 Which bullet journal butterfly theme spread was your favorite? How Are You Decorating Your Butterfly Theme? 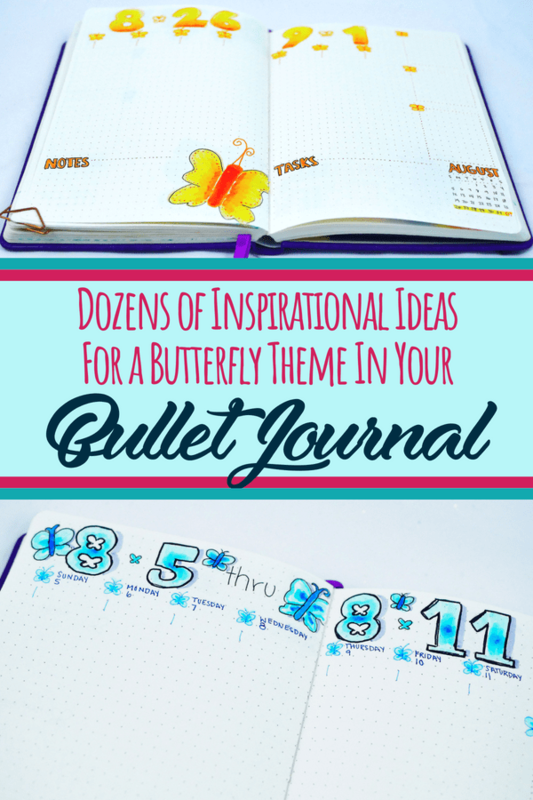 If you are doing a butterfly theme for your next bullet journal spreads, I would absolutely love to see it! 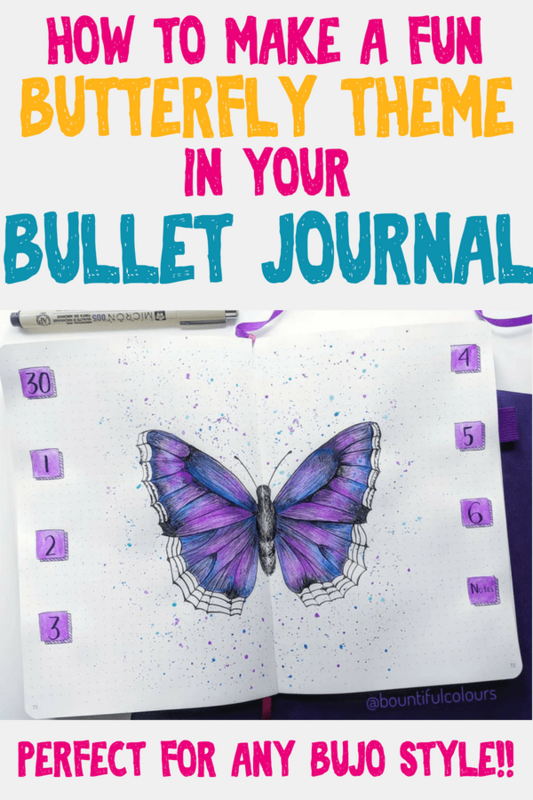 Even if you’re not doing a butterfly theme, I’d love to see whatever you create for your bullet journal. 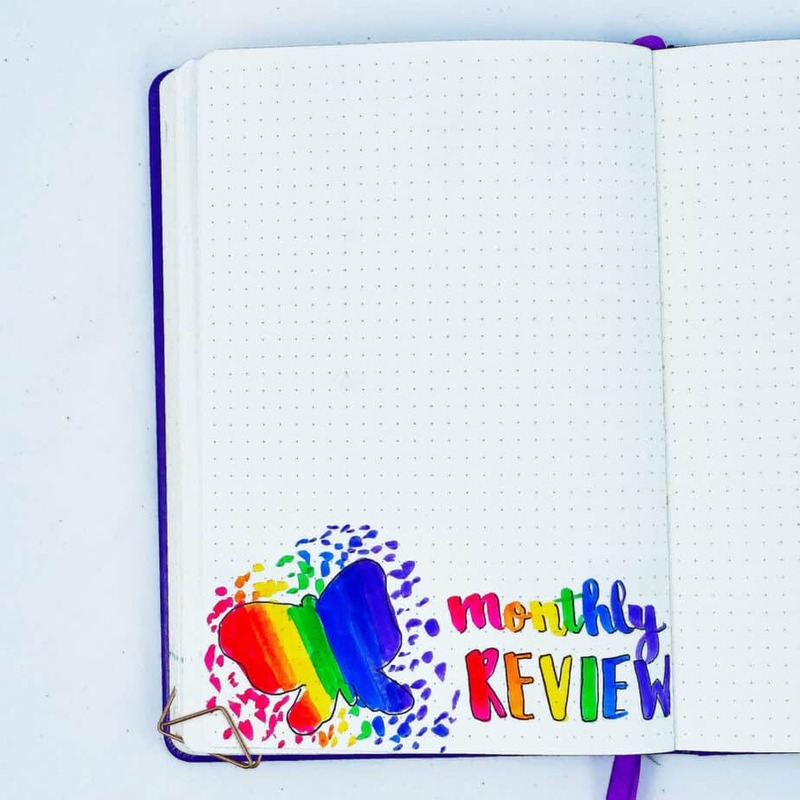 Who knows, maybe next month I’ll pick your theme for my bullet journal monthly spread! If that’s the case, and you’ve tagged me on Instagram with #plannerpicturefeature, maybe you’ll get featured in the next blog post. 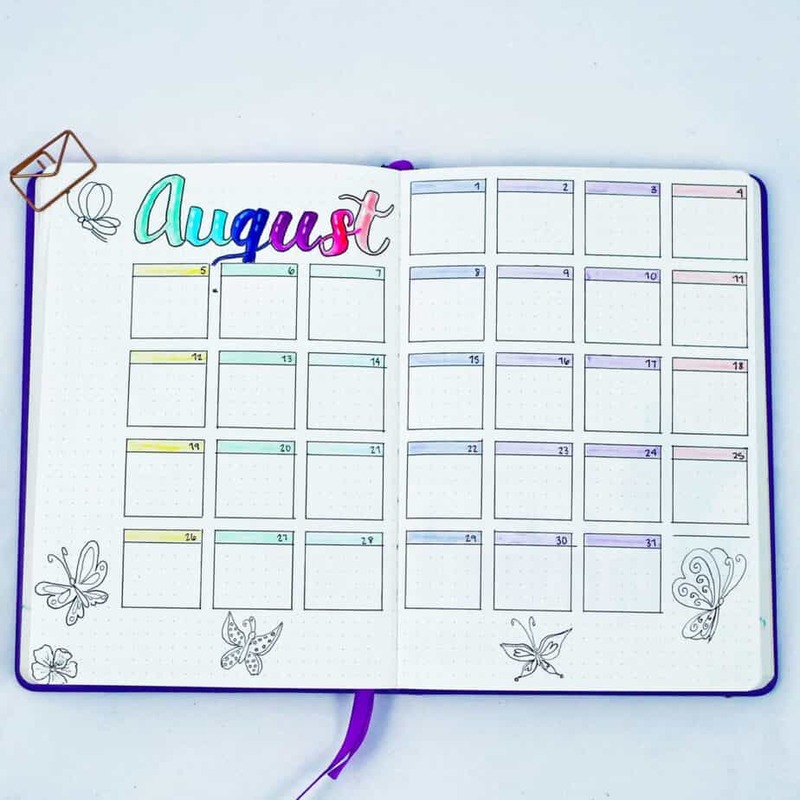 Remember, next month is a rainbow theme… hint, hint! Need some other bullet journal theme ideas? 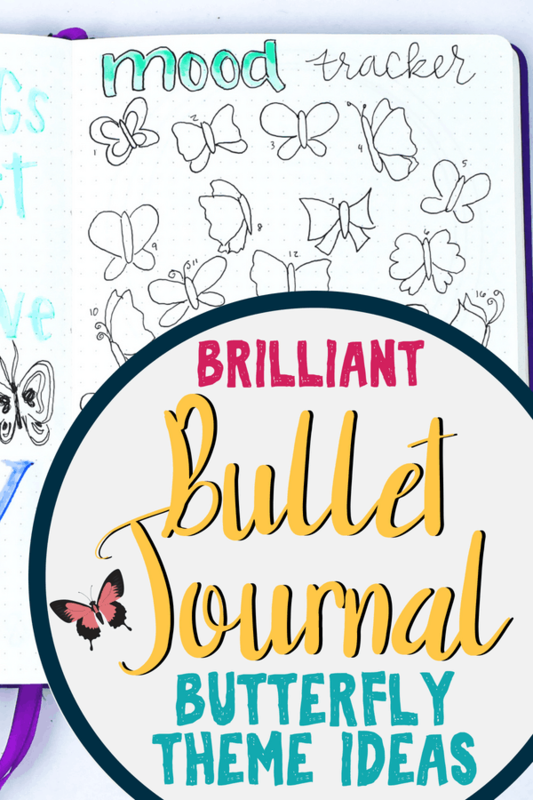 Here are 12 fun bullet journal themes you should try for the next year! What was your favorite butterfly spread in the post? Tell me in the comments! Please share with others on Pinterest!! !